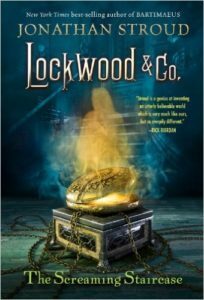 I was a big fan of Jonathan Stroud’s Bartimaeus series when I was in (the Indian equivalent of) high school, so I’ve had his new Lockwood & Co. series on my wishlist for a while now. I’ve been reluctant to actually read it, though, because things I liked in school don’t always hold up when I read them now, and I didn’t want to tarnish my memories of Bartimaeus. My friend Sashank recently asked me to read and review the series on my blog, so I decided to take the plunge. The world of The Screaming Staircase is very much like our own, except that for the past fifty years, dangerous ghosts have been haunting the world at an alarmingly high rate, and only children have the psychic sensitivity needed to sense and combat them effectively. We follow Lucy Carlyle, a fourteen year old Agent from the country that moves to London and joins the small Lockwood & Co. company. After one of their ghost investigations goes horribly wrong, they are forced to take on one of the country’s most haunted homes. I wasn’t that excited by the plot itself. There wasn’t anything notably bad about it, but I just wasn’t drawn into it that much. I was willing to forgive that because it’s clearly setting up a larger world and mysteries to explore. Overall, I’m glad to report that instead of tarnishing my memories of Stroud’s previous works, reading The Screaming Staircase just made me want to reread them. This entry was posted in Books, Reviews and tagged fantasy, fiction, horror, middle grade by Kriti Godey. Bookmark the permalink. Thank you, Kriti, for obliging my request!